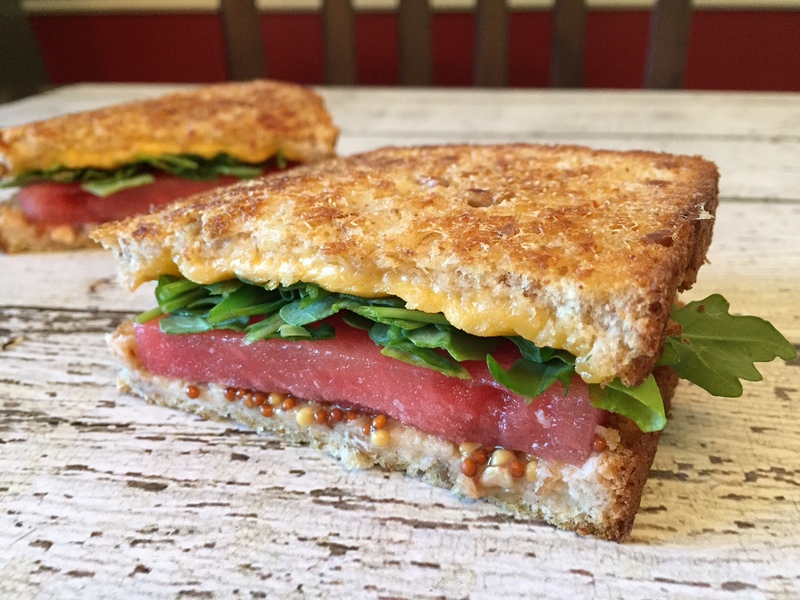 NEW YEAR’S RESOLUTION UPDATE: GRILLED CHEESE ARUGULA PANINI - What About Watermelon? When I first discovered this recipe I had to scratch my head. Being a self-proclaimed “foodie,” I must admit that I had only a fleeting knowledge of what was arugula was. Arugula, pronounced “a-roo-guh-lah,” is sometimes referred to as “rocket” or “rucola.” This leafy green is similar to lettuce, but with smaller, more pronounced leaves. Notable for its high dietary nitrate levels, arugula helps lower blood pressure while packing a vitamin-filled punch. Health benefits aside, arugula is a delicious addition to this simple dish. Give it a shot, and let me know how you like it! Place watermelon pieces between paper towels to absorb extra fluid. Set aside. On each of four slices of bread, spread mustard, and top with 1 ½ ounces cheese. Top with second slice of bread. On a griddle or panini grill, spray cooking spray, and grill the four sandwiches on each side until cheese begins to melt. Remove from griddle/grill, open, and place a slice of watermelon and arugula inside. Close sandwich, and cut in half to serve. NOTE: I made mine as a traditional grilled cheese instead of a panini. If you’re making a grilled cheese, use real butter – not margarine – on the bread. Melt it in the microwave first, and then brush it onto the bread. Also, cook your grilled cheese on a medium-low temperature (around 250 degrees if you’re using a griddle). It’ll take a little longer, but that trick (and the butter) will create a perfectly crispy grilled cheese every time.